The vertical axis extends from the peak of the dome over the assembly to the spot on the floor directly below, often marked by a round disk. Sometimes the floor under the dome is well designed as the inverse of the dome, to suggest an equal descent. As Christ rose from the depths to sit on high, so too believers are caught up in this upward movement in the process called divinisation whereby believers come to share in divine life. 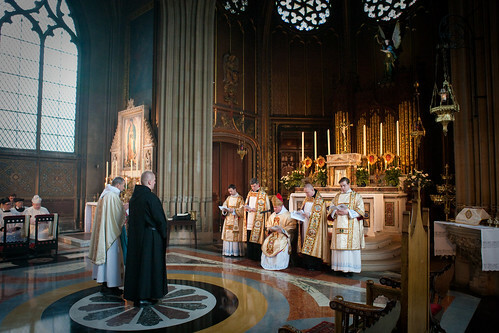 Being snatched up is ritually expressed in the photo below of Br Michael making his solemn profession as a monk of St Michael’s Abbey, Farnborough. He ritually descends by prostrating and then he arises by standing is standing on the central disk under the dome. 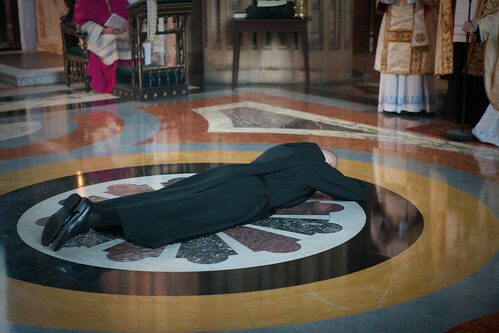 Br Michael ritually descends by prostrating. 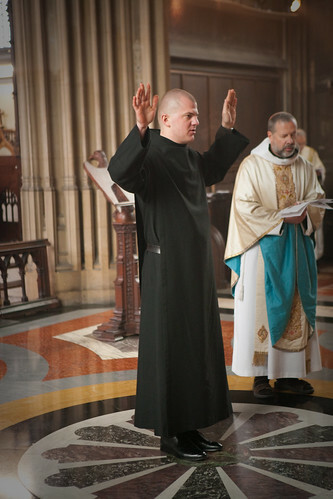 Next Br Michael rises up by standing and raising his hands in prayer asking the Lord to receive him in his monastic profession. This vertical axis of a church through architecture and artistic design enhances the ritual expression of this central dynamic of Christian life, coming to share in divine life. Parish churches might develop such a place for the exchange of wedding vows. It could be used as a place to receive communion and as a place where the deceased lie in state. At the recently restored cathedral in Chartres, France, the vertical axis or axis mundi is clearly articulated by the central plan on the floor and in the vaulting directly above. Following a traditional arrangement, the altar is set back from this central axis – in several Roman basilicas the altar is set forward from this axis – so that each might have its own ritual space. 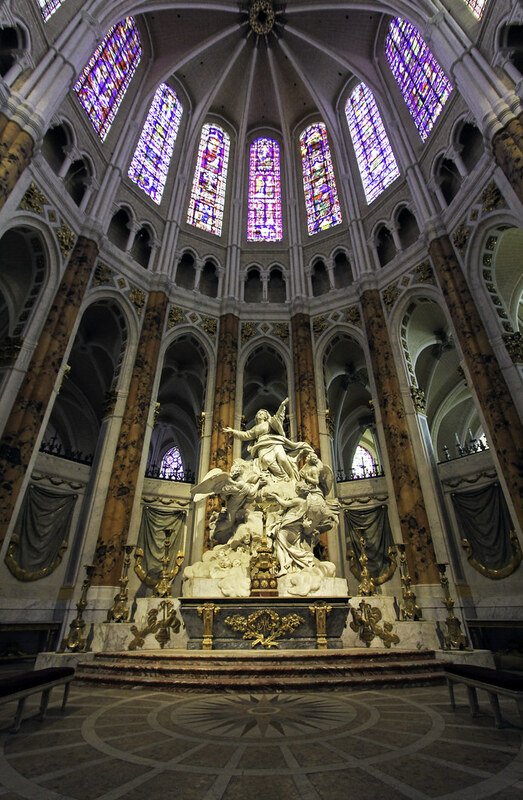 The image of the ascension of Mary narrates in sculpture the personal transformation that occurs when people come to this central axis to share communion, to promise vows, to receive an anointing, to lie in vigil.